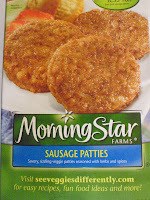 Morning Star Veggie Sausage Patties- get the patties, not the links--very important. Easy to microwave in the morning, but put a damp paper towel over them so they stay moist. I put mine on an English muffin with egg and American cheese and pretend it’s an Egg McMuffin. Boca Breakfast Links - get the links, not the patties. Also easy to microwave and tastes good with syrup. Gimme Lean Ground Sausage – you can find it in the refrigerated tofu area; it comes in a tube. I love things that come in tubes. Anyway, don’t try to patty this and cook it up, unless you really are a vegetarian. This stuff is good for casseroles and recipes where sausage is not the main attraction. You might even be fooled for a second. 2. Saute red bell pepper and onion in olive oil until almost tender; add veggie sausage and crumble well. Cook until sausage is heated through. Set aside. 3. Combine milk and water in a saucepan and bring to a boil. Stir in grits and cover, then reduce heat, and simmer until mixture is thick. Stir often. 4. Combine grits, sausage mixture, cheese, parsley, salt, garlic, and peppers in a large bowl; set aside. 5. Beat egg whites at high speed using a mixer until stiff peaks form. Gently stir one-fourth of egg whites into grits mixture; fold in remaining egg whites. 6. Add mixture into a casserole dish coated with cooking spray. Bake for 25 minutes or until set. Make sure you serve this dish hot, because the sausage crumbles start to get a rubbery texture when they sit out for a while. Good for brunch.